When I was in college, my roommate Rachel’s family moved several states away. Sweet family friends, Glenn and Trish, became her Florida family and by extension, an extra family for me! We would arrive at their house in Rach’s Camry, wearing our thrift store t-shirts and worn out from exams and a few too many tubes of cookie dough and $5 Pizza Masters pizzas. They would welcome us with open arms, and curling up under the corduroy duvet cover in their guest room was like being in a peaceful oasis. …That is, until Glenn decided to wake us up for breakfast. With an air horn. My memory on the details of how it all went down is a little fuzzy (maybe from the trauma?? or maybe just because it was over 10 years ago? wait, how is that possible? ), but it was the kind of earsplitting blast that makes you wake up in an absolute panic – who am I? Where am I? Should I run for my life or put on a bra first?? He got us good. And was quite delighted with himself. I’m pretty sure the air horn happened more than once, too, and I’m also pretty sure we never got revenge even though we swore we would and he would have deserved it. 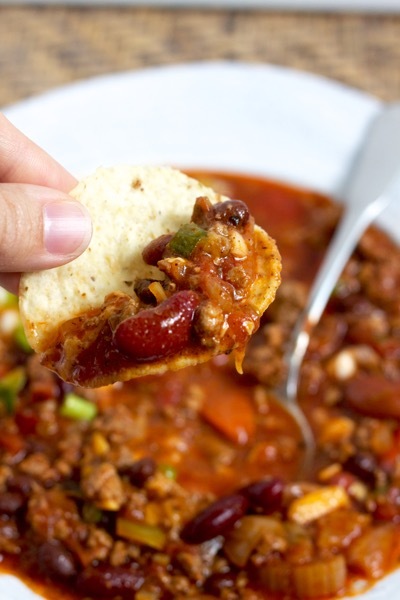 Glenn made us this chili on a really-cold-for-Florida weekend, and this was the perfect way to warm up. It’s spicy and satisfying and I love the ratio of meat to beans to veggies to liquid. Glenn doesn’t follow an exact recipe, but Trisha wrote down an approximation for me and I haven’t tried another red chili since! First you need a big pile of crisp veggies – onions, bell peppers, and celery. Brown up the ground beef and add spices – thyme, basil, bay leaves, salt and pepper, and of course, chili powder! You also need a mini bottle of Chardonnay wine. I love having these little bottles around for cooking! Tell me this isn’t the most beautiful chili base you’ve ever seen. Next you add a can of tomato sauce and diced tomatoes with green chiles – like Ro-tel, or this kind from Trader Joe’s! The fire-roasted tomatoes add a great flavor nuance. A little brown sugar offsets the acidity of the tomatoes, and then the chili simmers for about an hour before you add a couple of cans of kidney beans to finish things off. 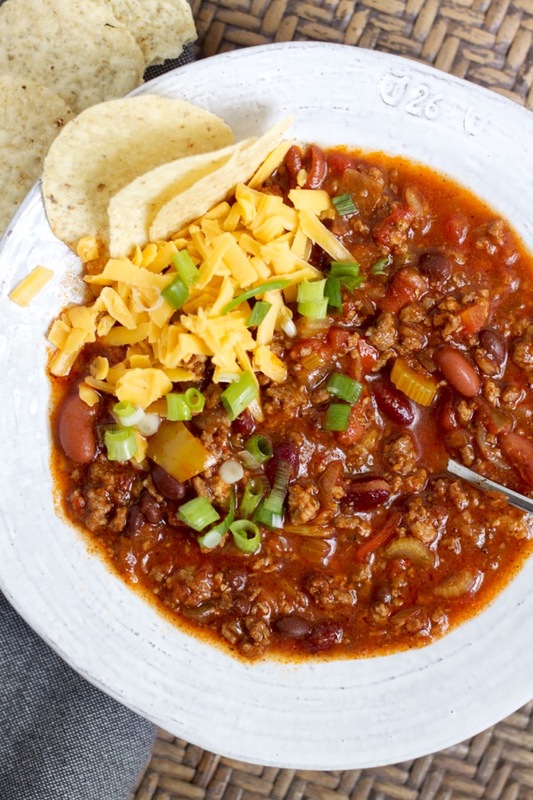 I love the big chunks of peppers and celery, the texture of the beans, and the saucy part that has a great kick but isn’t just about the heat – it has such rich flavor from the wine and herbs. Thanks to Glenn and Trish for the recipe, and the hospitality, and the fear of loud noises. ;o) Love you guys! Let’s be real, the spoon is basically a prop – I prefer to scoop with a chip! Heat a large pot over medium-high heat and add beef. Brown the beef by letting it sizzle for a few minutes, then stir and break it up with a wooden spoon, cooking until no longer pink. Drain off any grease and add wine, salt and pepper, chili powder, bay leaves, basil and thyme. Add onions, peppers, and celery. Add all the canned tomatoes and brown sugar. Simmer, covered, over low heat for one hour. Taste and adjust salt and seasonings if needed. Add beans and simmer 15 minutes more. This recipe is by Glenn, a dear friend. The chili is wonderful (better??) left over, so it can be easily made ahead of time! It also freezes well. Bet – so I’m making this for supper (well, for tomorrow, but I’ll probably sneak some for tonight before I leave for church supper, haha). Anyway, I was getting groceries at Aldi and was looking for wine since I was there and I ended up getting a cheap bottle for $3. I used the 6oz and then froze the rest in a 3oz each cube ice tray for later. I looked it up and people said it works well! Brilliant! I’m going to have to try that! !